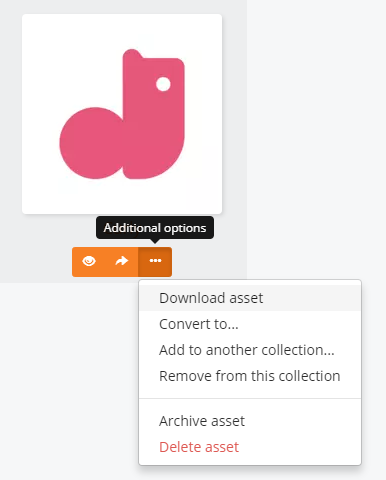 You can download assets from Chipmunk in order to save them to your device or share them outside of Chipmunk. Select Convert to... if you need the file to download in a different format. 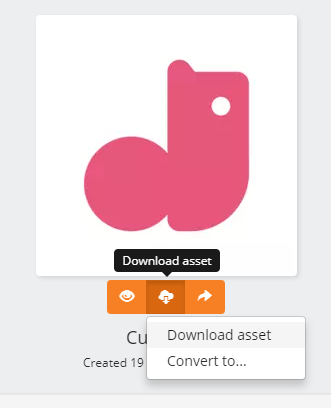 You can download the current file for an asset by navigating to it, clicking on the button, and selecting Download asset. Or, when hovering over the the asset's thumbnail, click on the menu and select Download asset. Once you're viewing the asset, if it has previous revisions you'll see them displayed beneath the current preview in the revision history, going from the newest one on the left to the oldest one on the far right. 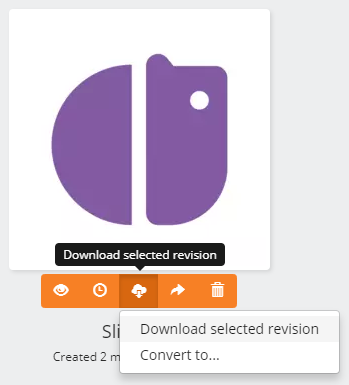 From here you can click on a previous revision to select it and then click on the button to access Download selected revision.